When it Comes to Christmas Gift Baskets, Quality and Presentation is Everything. 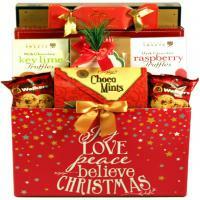 Send a Christmas Gift Basket You Would Love to Receive Yourself. 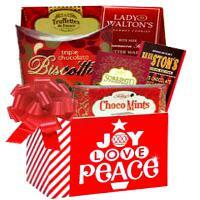 Among the thousands of holiday gift ideas, the perfect holiday gift that you can choose would be holiday food gifts. 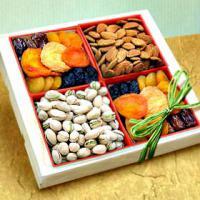 Holiday food gifts containing gourmet food, cheese, chocolates, nuts, cookies and fresh fruits are enjoyed by everybody on every occasion. If you love to give your dear ones a very special holiday, choose a holiday food gifts. Fruits and chocolates are perfect not only for holidays but all occasions. We always enjoy the festival with a delicious gourmet treat containing a variety of tasty food items. A gift basket is the perfect gift choice. Holiday foods are considered as the most desired family holiday gift and certainly a favorite among the youngsters as well. Kids love the colorful sweets and chocolates. What Does Everybody Love to Receive For Christmas? Gift baskets containing a variety of food, fruit, and chocolates will delight the hearts of the recipients. You can find a broad range of festive holiday gift baskets and gifts at the Adorable Gift Baskets online gift basket website. Each holiday food gift basket a unique gift item for the holidays. Select unique holiday gifts from a huge variety of holiday food gifts that are impressive and affordable. 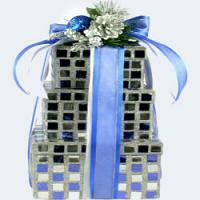 Our gift baskets are designed with utmost care to ensure that each gift basket is unique and extraordinary. Take the stress out of Christmas shopping. You no longer need to concern yourself with finding a parking space, pushing through crowded shopping malls and standing in long lines to checkout. 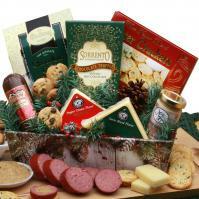 Holiday food gifts are easy to find and purchase through our secure online shopping cart.